Welcome to my stop on the Fabulous Summer Sampler 2018. This year, the focus is on blocks designed by travel inspirations. 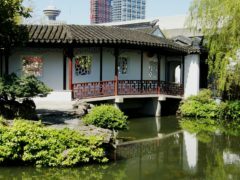 I must admit that I have never been to my inspiration location China, but I have long admired the architectural beauty of buildings and furniture indigenous to the culture. Perhaps someday I will make it to the Far Eastern Part of the World, but for now I will admire from afar. Although pictures such as this one make me want to jaunt right over there. That’s all it takes right? A simple skip and hop to get there? 😉 But look at the railing on that bridge. Isn’t it spectacular? All those lines and corners are what lead me to draft up the design for my block, Shenzhen. 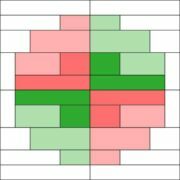 I used EQ8 to put together my block and mock up multiple colors. I really loved this coral and green ombre option. When I went to make the block myself, I decided to stick with an ombre styling but with patterned fabric rather than solids. Also, I wanted to show the block with a low volume background rather than a solid white as the group mockups show. I love how strong the center stair step design still is with all of this pattern. My biggest tip for putting together this block is to really focus on the 1/4″ seam allowance. 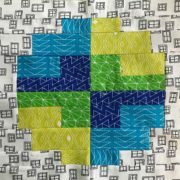 The straight seams are easy to put sew but whenever there are lots of seam allowances, there are lots of places to throw off your final block dimensions. I used my 1/4″ seam allowance foot on my machine and had no problems! I also am pretty type A so I like to press each row as it is sewn together. I hope you enjoy making this block! I can’t wait to see all of the color options and variations you guys come up with. I must admit that I’m quite fond of the Rainbow Spectrum Mockup that Faith, Lee, and Katie proposed. Who is doing that version?! There are bunches of great designs and designers coming up. It’s going to be a fun time! Thanks Angela! I’m really anxious to make your block! 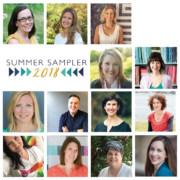 Did I miss “Summer Sampler 2018 – Block 1? I have been a bit disappointed by the lack of direction on how to use the rainbow kit. Agree with Marilyn. I am sure I will figure it out and it will be lovely! Cool using an interesting bridge to inspire your block design! 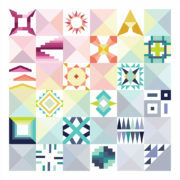 I really like your block and the the rainbow version of the Summer Sampler. I am going to give it a whirl. I just hope I figure out which fabric to use where,…. and I have enough fabric. 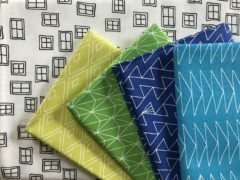 What a clever and pretty block – I love the fabrics you chose Angela. So glad to see you sewing and being creative!